I am not an artist and not an art historian nor a critic by training, but what I will talk about today is beginning to become a part of my research interests. It is pretty much based on the last seven or eight years of my involvement outside of the academy with which I work, involvement with the local community and including the cultural community. I’m going to talk about M+ and M- and will explain what they mean. The second remark I want to make before I begin is that before talking to Daniel about this presentation, I actually rarely, if ever, used the concept trans-cultural. So I told him what I would be interested in doing and I don’t know whether it fits into your conceptualization of the trans-cultural, but this could be an interesting discussion following from what we had in the last two presentations and anticipating tomorrow’s further interaction. In both the culture study program, the academic program, and also in the context of Hong Kong’s change since 1997 both from a political and a cultural point of view, cultural projects, including my talk, have begun to play an important role in the bigger picture. Of course globally, we can see in museum and curatorial practice across the globe that we face the challenge of what some critics call the “post-museum” as in a “utopian display institution” to allude to the concept of the utopian that we refer to. But here I want to underscore that if I use the term utopian I don’t necessarily mean it in the negative sense as something that is unrealistically idealistic, but also with a positive dimension, a positive sense. How do we face the challenge today of the post-museum as a “utopian display institution,” as some critics have recently asked? Like us all, the museum as an institution is not only becoming more gigantic, multi-functional, and perhaps trans-cultural, but it also is triggering the reinvention of a metamorphic social space in which the visitor’s experience are at stake. And often these visitor experiences are also consumerist experiences in one way or another. Everywhere, curatorial work gives way to this or that version of the “mega urban” project. In Hong Kong today what has been called M+—“M” alluding to museum, but the actual full name is M+—is part of the 40-acre West Kowloon cultural district mega project that promises to bring top-notch culture to the metropolis, branded years ago as the a global city by the post-97 government. Lars Nittve, formerly of Tate Modern, came to be the curator of the what is later to become M+, because it has not yet been established and realized yet. He promises that the plus to the project would extend the conventional work of art and culture to visitor education and interactivity, so this is in line with the global direction in the development of museum and museum studies. With the West Kowloon site still an empty spread of reclaimed land lying by the spectacular Victoria Harbor, it appears that under the city’s cultural policy the original Museum “proper” would not be enough and we want more for many years. And the project has actually been part of the Hong Kong government’s agenda for almost ten years. But it has not begun. We are only right now at the moment of beginning to sit down to plan and build and hopefully present artwork and cultural activities throughout the West Kowloon, of which the M+ is a part. There are other cultural facilities being set up as well. Now in this talk, I shall start with the implication of all this from the viewpoint of the convener of a civic alliance called People’s Panel for West Kowloon, this is one of the activities that we organized in 2007. For those of you who know Hong Kong this is the Cattle Depot Artist Village, and we had the first of a series of civic forums for what we wanted for the West Kowloon. At the time there was no plan like what we have now. But then later I will turn to focus on a completely opposite approach, an attempt compared to the M+ imaginary: the Museum- project which actually just started little more than nine months ago. So, interestingly, the one is big in scale, if anything, while the other very small. Both of them are in progress and not yet completed. In a way the Museum- has started doing something because it is so small it has completed its first pilot but its formal establishment and program has yet to be developed. But M+, the mega project for the whole city, is still in the process of developing. A little introduction about the M- it is launched by a small group of local artists, academics and social activists. I’m involved as one of the groups of academic groups that are working with them on this project. The M- is subtitled The Hong Kong Today Exhibit-; it is especially about Hong Kong today. I see it as a bottom-up cultural project committed to transforming the museum visitor experience and transgressing the borders of artistic contemplation and political action. It aims to address social issues and challenge the cultural and political imagination of the public through curatorial practices. Drawing on the innovation of the responsive and participatory museums the world over, it stresses the need for inter-subjective communication and through its museum practice opens up a reflective pedagogic space for questioning how hegemony works in our culture. In that sense, it is a space for learning about Hong Kong today. The project receives no front-end public funding support, unlike the M+, but works to display and question, at the community level, the social narratives available in the city. With critical museum pedagogy it organizes its exhibits by merging politics understood as the play of power in all its complexities, with culture, broadly conceived as design, interpretation and imagination of cultural signification and representation), in an attempt to underline the specificity of culture with the power relations that make it work. Its important to contextualize it: the other day you were asking me why the minus? The minus is a conscious decision to position ourselves against the plus. The People’s Panel for West Kowloon has worked for a number of years, but now its almost in an inert stage because community engagement so forth has completed the cycle, it could be said, although if you ask me I would say we have not achieved what we wanted because the community’s interest has actually diminished. That’s a side issue. I’m borrowing a slide that I used for a presentation in Beijing some time about the West Kowloon on that topic. An essential question came up that I thought would be useful to share with this audience: How should civil society engage with the West Kowloon Cultural district? (WKCD). This can show the kind of issues that the People’s Panel for West Kowloon has been concerned with before the actual work has begun through the government’s institutions. So it’s straightforward: the West Kowloon District Authority should explain how the money, 21.6 billion HKD, translated into a little less than 3 billion USD, is going to be used? And there was a huge concern of the community that the authority should not be a developer, but actually a cultural district institution acting on behalf of the people, because this money is taken from the taxpayers’ pockets. And it’s already been injected into the authority’s account. The artists are more concerned that the project be led by art and cultural professionals and not bureaucrats. Right now the composition of the board is still very much led by government officials with only minimal artistic representation, but includes people from the accounting and legal sector as well as the business sector. This would be a concern very much raised by more active cultural leaders, community groups who are involved in cultural activities throughout Hong Kong. A specific concern is that the Arts Developments Council, which is another statuary institution in Hong Kong responsible for funding and developing art throughout the territory, should play a key role in the project. I sat in the Arts Development Council for three years, but unfortunately there was no desirable outcome from this perspective because the government continuously does not want to have a more close and direct link with institutions like this. And it itself is a public institution, which has been set up for fifteen years in Hong Kong. The concern that the planning of the hardware, meaning the facility and all the urban planning going on, should go hand in hand with what we call the cultural software, the programming ideas and so forth. But as you can see the place is still like that and there are now more concrete plans for building and for the design of the area. But the work on the cultural programming ideas and direction—of course we’re not talking about actual programs on a year by year basis, but the overall direction—has not yet begun. Should this become an icon and a driver of Hong Kong’s urban project? In connection to that because the board is pretty much dominated by government officials, there are again huge concerns that the governance must be dedicated to other bodies as well. These are all concerns and recommendations that have not yet been responded to. Government and civil society should build trust and dialogue. We’ve been talking about dialogue as an important space and so forth. Not only because public money is being used, but because in order for the project to eventually be successful, i.e. drawing an audience from both at home and abroad, really the active participation of local people, whether it is in terms of their artistic talent, cultural development strategies, support services or their participation as visitors, is quite important. So this has been a central concern of the People’s Panel in West Kowloon because we really represent not just the cultural sector, but the community at large where the community has a part to play and in what way this will activate community interest or a role in artistic and cultural practices in general. To give you a concrete example, attempts have been made to build into the ordinance of the authority that the composition of the board should consist of key representatives from both the art sector and community sector that are in various parts of Hong Kong. Because this is situated in what is West Kowloon, that area in particular is not a community because there are no people there, it’s a reclaimed piece of land. It didn’t have a history although areas surrounding it are all districts with old neighborhoods. We are concerned about public participation and that this kind of participation should be more proactive. Instead of doing that we are thinking that we should really ask more interesting and telling questions if we really want to engage. And we should actually go into process of having more dynamic workshops with different community groups. To be fair, they have been doing that. But again, as I said, the outcome has not been more enthusiasm in the community, but actually less. I think part of the reason is that its been a long, long process and people don’t know what’s going and they’ve just completely lost interest, including, sadly, a lot of the younger people in the arts and cultural sector who are doing creative works in different neighborhoods and areas of the city. They don’t believe that West Kowloon is really for them, that this is some mega utopian project that is now being instituted. Such a huge project takes a long time to plan, you have to develop phases. Now, in the meantime, people change, people go on with their lives, the economy changes, the political environment changes, so you can’t leave it until the day when everything is built and then start at your cultural work. The suggestion is that you really should prepare by enhancing the city’s regional public space for artistic and cultural activity, and so on and so forth. So that you can actually articulate, integrate culture and creative works in the various districts. But unfortunately, the primary concern of the West Kowloon Cultural District, was to make what happens within these 40 acres of land “work” before they have time to think about what’s beyond. If people outside the district are not keen and excited and doing things and contributing ideas, they would only be continually alienated from this. Despite it being such a mega project, we said that it should be built on the principle of cultural diversity because the following arguments might be raised: “What represents Hong Kong’s culture?” or “What should be the role of Hong Kong in terms of the cultural development of China or Asian context?” There have been a lot of questions, but unfortunately no serious and ongoing discussion. We have proposed this, but it has not been taken on by the authorities with a sustained program. The question about synergy about the art space and what is outside. More specifically with M+: what will be the relationship between the M+ and the other museum spaces that are already existing in the territory? I think 80 percent of museum space in Hong Kong are government funded, with a small proportion in terms of area for exhibits run by the community and the private sector. Now, Hong Kong is quite small, I mean the population is not that big. There are more and more people coming as tourists from different places, especially mainland China. Still the existing cultural infrastructure would need to be developed. So this is the kind of question that would be in people’s mind. West Kowloon needs a museum for literature. They are going to build a center for literature in Hong Kong. I think the reason that this has been raised, being such a spectacular project with emphasis on a big performance centre and M+ being a very trendy project there has been concern that there has been more attempts to look into the historical, cultural, and literary processes and works that are ongoing to tap into the historical and cultural roots of the community in the past at least four or five decades where Hong Kong was separated politically from the mainland after the Second World War, creating a space for a lot of literary and other cultural production. And literary works have occupied an important place because they are more readily preserved and circulated and therefore something that should be emphasized. This is now something that has been addressed by the authorities, so this is good. What is the current situation? 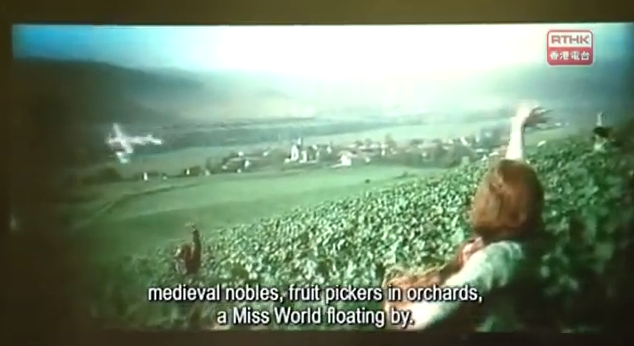 I will show you a small clip by Norman Foster whose concept design for the district has now been approved. His basic concept is to develop the whole area into a city park where cultural facilities and other residential facilities will be built in. I think that gives you a sense of the kind of project that has evolved and we are now at a stage where Foster’s design has been chosen, I think just a few months ago, developing different ways to put this in place. The sad reality is that there really is no cultural policy in Hong Kong. And today the entire project has been pushed forth with the joint forces of governmental bureaucracy coupled, ironically, with weaker and weaker governance with the Hong Kong SAR for very complex political reasons. They have been received locally with a lot of skepticism and inertia including among the cultural and artistic community. For most critics the super rhetoric is “all fine” minus the vision, strategy and policy to put in place the appropriate institutional provision for freeing the promise, the imagination through the site. Mega museum projects and exhibits have been powerhouses for the very display of power in postmodernity. By contrast therefore, museum M- which was started by a bunch of young people, supervised by the Honest Society, which is a small group of young artists, a creative team consisting of young people from a variety of fields: including education (some are teachers), cultural studies (some are students and researchers), art, design, policy research and social activists. And some identities overlap. They work with academics, like myself—I am the only academic from cultural studies. There are other academics from the fields of sociology, political science, administration and so forth. They work together to analyze and discover problems for the exhibit and articulate critical perspectives to creative solutions. The academic team in particular offer perspectives in culture studies, politics and public administration, comparatively as well in communication and social enterprise. Targeted at the general public, teachers and students in particular, as well as tourists, this is considered a project in what I call the “cultural production of hope” and I want to offer a brief examination of its options. But again as I said, instead of it being a complete analysis as the project is still in its very early initial stage my analysis could only be tentative. The inaugural display of M- in 2011 focuses on the theme of real estate hegemony in Hong Kong (entitled the “Hong Kong Today Exhibit”). They have talked about a range of other possible topics in the future that could be worked on together with NGOs and other partners in the community, on topics including public space, the grove of shopping malls, and of course social topics like poverty, homelessness, and even public transport. And there are other more political projects which people are very interested in. They include human rights: rights of all kinds, rights of freedom, rights to welfare and increasingly in Hong Kong the more sensitive issue of land use and land policy tied to the issue of land and housing. But the inaugural display is one on real estate. It puts into play a curatorial space that mimics a model flat for sale on the market to look at the effective work of hegemonic spaces dominating our social realities. By allowing visitors to perform themselves in this visit to the site, and therefore as potential buyers of this flat through interacting with the curatorial space, this projected museum minus experience poses a challenge to the prevailing official social narratives or social discourse about buying a flat, about the need and the desire for home. And we’re not talking about concepts and identities of home, but a real place to live in, in that physical and urban space that we have a glimpse of. I’m going to show two clips. One is part of a documentary by the radio television Hong Kong, which is a public broadcasting institute. They present a program called “The Works.” On June 28, it described this M- real estate project. The flat that you are going to see is a real sized flat. It’s really small: I think it is 300 square feet in total. It was actually originally the group’s temporary office; it was located in an old warehouse building that still exists. They transformed it and turned it to the demonstration flat. What happened is that they then arranged through our network to meet with different visitors: students, professional groups that are involved. I went with two academics. We met at the subway station with one of the contact persons. I asked: “Where are we going?” and she replied, “You’ll see.” They brought us to a real estate agency. Somebody was standing outside the agency, all dressed in a suit and tie but he was actually our “museum guide,” our version of the museum guide. The “museum guide” leads the trip and the trip lasts about 45minutes. The point is that this is a clear conscious visit to a simulation, but then the environment is real. The environment is actually not presented as an exhibit or a museum, it is presented as a flat you will see, which is very common in Hong Kong, especially the last five to ten years, when people are buying flats and so forth. Actually a lot of middle class couples make it one of their weekend activities by going to see all sorts of demonstration flats. So I want to show you this part and I will comment on it. 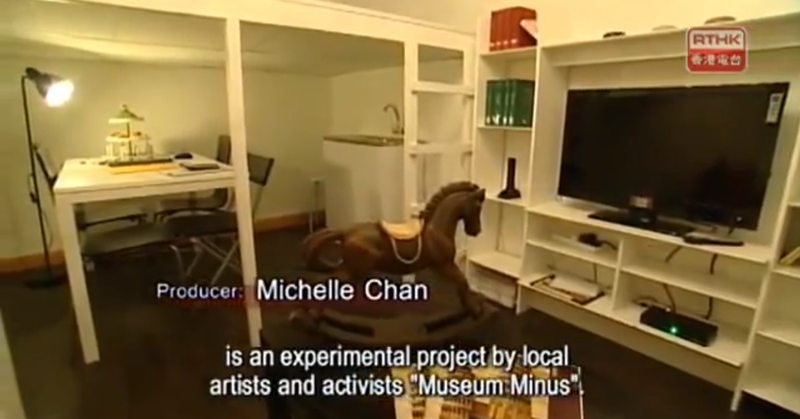 Stills from a program called “The Works” aired on RTHK in 2011 about “Torre pendente di Pisa”, an experimental project by local artists and activists “Museum Minus”. Inspired by what they call the growing “Real Estate Hegemony”, they turned their 150 square feet office in an industrial building in Prince Edward into a duplex show flat. Before visiting the “show flat”, visitors are required to take part in a role-play briefing. They will be potential buyers dealing with a “property agent” played by an actor. The agent reported that everyday he received questions that he couldn’t answer despite a lot of preparation and training! At the end of the visit they were confronted with a paper to sign. That was the moment where a lot of visitors were prompted to reflect although this is only a simulation. They had been driven to think about buying a place in Hong Kong. Of course this is an exaggeration, but we believe that these exaggerations they are no more than the kind that we find in the real market. Bani Abidi (BA): Can I ask a question? Was it actually put on the market or was it an art project; were the people who came in ignorant of the fact that it was a set-up situation? Stephen Chan (SC): They knew it was a set-up situation. Manuel Cirauqui (MC): Within the simulation all the participants had a plan of what they were going to say? Like people from the acting school or the artists had a script? SC: No, no, visitors don’t have a script. They knew it was simulation. They knew they were going to see an exhibit. MC: What were the premises of the visit? They knew they were going to see an art project, but they didn’t know what they were going to see? MC: Alright, so it was not like going they were going to buy. SC: They knew that the art project was to go see a flat. Max Burger (MB): That’s the art project. Instead of going to see a painting, you are going to see a flat. SC: Yes! The idea was, and as I said this was a pilot. It was very labor intensive. You need an agent who is an actor to play this every time. We can’t afford much, so we have to plan our resources very carefully. But we organized it through our small-scale internal network, choosing people who are interested. There are two versions of the plan, one version is to hire a place for instance and then you set up, if we are still using the real estate theme, because there can be other themes like transport or what have you, there will a set and there would be other spaces where you would have an actual exhibit—in this case they had some brochures about real estate in Hong Kong, advertisements for Hong Kong, and different kinds of stories related to this theme. But in this setup there is no space physically to do that, in our plan one would be able to that after the visit, so you would go through a more objective stage of viewing data and at the end of which you would meet other people or visitors for a debriefing. Because for this particular project every visit has to be in very small groups given the size, and that was actually the idea. Because you can then experience the moment where you actually need to make a choice, although you know that this is simulation, but you are presented with real figures. The cost is real; we are copying and mimicking the actual apartment price. At the end of the process, the visitor will have the opportunity to meet other visitors and to have the space and the time to talk about this. MC: This is the whole Museum minus or is this just one chapter? The apartment and the situation with the expanded documentation rooms, is that the museum minus? Or is this just one application of the museum? MB: You should say that this is no joke. One example is that there was a building with 20th floors and they called the top floor the “88th floor” and they sell it as the “88th floor”. SC: So this is no joke. The exaggerations that you may see there, is no more than the real exaggeration in life that we actually find in Hong Kong. Monique Burger (MoB): Did you have other visitors other than students and teachers? Did the community within the building all go? SC: In this case no, because it’s not a residential place, it’s actually a warehouse. MB: Where is it in Hong Kong? SC: This is near Jordan. The next clip I am going to show you is the simulated commercial that they made based on what we nowadays see in the media for advertising such estates. So they actually made this video. There are two references to that. The first one is in the real market; a lot of these houses, apartments and estates have fancy and grandiose names. Your “pluses,” your “mega” projects. One of the artists’ pointed out that in Hong Kong real estate advertisements thirty years ago you actually were shown what was supposed to be in the neighborhood, what was accessible, the subway nearby. They maybe showed a taxi or a swimming pool. But now it’s always like this ad, more imaginative. The power pieces, the concept is that they have totally unrelated names and the other is the idea that, in Chinese, it is something, a delusion, not straight. So it is not true, it is exaggeration, total rhetoric. “Hong Kong Today” is a critical project in anticipation, in hope, in a utopian fashion, in a hope that this will give people some room for change. This is quite different from your actual political activism or social activism in which you go out and demonstrate and blockade the regions of the rich and the powerful. But this is changing the people’s thinking, challenging some of their received ideas and imaginations about life, about ordinary life, about buying a house or going shopping and other aspects that will be developed. Some data: during the period from December 2010 to July 2011, 3,000 visitors arranged to see the flat. There was some mainstream media coverage, you saw this clip, and also in some local Chinese newspapers. Because of the theme of the real estate hegemony, they were profiled in an A3 page, not in a supplement but very much in the main local news. Our main target was young people in mainstream schools, even parents. They have started also workshops in the process, before the actual flat was put on in order to test different things among the visitors, including whether they experience something like this, how much would want they pay, or do they like the show? And the result was actually quite promising. An idea that I think is important to mention here, there is a clear concern of capacity building for cultural institutes because it is really needed. Actually, about a week after this was shown in RTHK (1:31:35), we got copycats on the Internet. People making advertisements, commercials like the kind that you have just seen. But that is easy now with the technology and the skills people have. But the difficulty is that they don’t have the real visit to the site in which the visitor can actually experience, through the simulated context the process. So it is not just to present a sarcastic or ironic treatment, advertisement, but also a whole package and a whole process of creating a somewhat controlled environment much like most museums do, but for a lot of critical and self-reflexive, by critical you can also interpret that in that sense, that reflexive sense, self-reflexive contemplation. The emphasis is on inter-activity. We have also been talking about empowerment because it could easily give people a very demoralizing perspective or skeptical perspective in that we are telling them something they already know and they would wonder what is the point of it. That is the reason why the complete idea is not just the experience itself, the performance, if you want, on both sides, but after that there would be some other extra input which presents data or interpretations about the concerned theme and then eventually some interactions among the audience or between the audience and some of the facilitators. I want to make some general comments on museums and curatorial practices on the basis of this example. First of all, it is quite clear that this is something you will not find in the M+ domain. The discussion in other parts of the world of what has been called “post-museum” is an interesting reference in this context. Post-museum in the words of Chris Bruce is a “flexible constantly changing social space prioritizing audience choice, interactivity and pleasure. It is a participatory experience which can lead to moments of self-actualisation for the visitor.” So the perspective is very much focused on the visitor’s perspective and through that experience, self-actualization, self progress, determination. In the case of couples, young couples or middle aged people who may want to buy a flat, it provides them an experience to think about their choice in the context of these seemingly exaggerated but real situations and real figures. Post-museum asks why would anyone want to build another museum or to present another exhibit? Three points can be isolated here for our further discussion in answer to that question why would anyone want to build a new kind of museum? One: an impact on the community. Two: it is techno-centric. In our case, due to the example of copycats from the Internet, we have realized although the real estate experience is important, we should not under estimate the usefulness of the new technology for this kind of interaction, especially among younger people. So we will be looking into ways to activate it. Three: a kind of entrepreneurial attitude. In this case, our thinking is that we are not going to get any public funding for this kind of project. Because as soon as they understand the underlying purpose, this will not be so. It has to become self-sustainable in some way. So therefore we are looking at that in a collective project, maybe in a form of a social enterprise. Finally, what methods of engagement can be created to expand peoples’ consciousness and even to change life? So, it is for this purpose, to answer to the question why M-? The idea of M- versus M+, because in the idea of M+ it has been suggested that traditional, conventional museum is not enough. We want more, more in terms of “mega” in terms of scale and more in terms of cross-disciplinary and dynamism and so forth. But less, meaning we want to abandon the term of ‘museum’ in favor of more grounded dynamic lived and livable projects that will articulate the experience outside of the curatorial space. Maybe they go back into another space. That space might be the school space in which they are students. That space might also be the M+ working class, puzzling over housing issues, problems, or young couples including university students and graduates who are increasingly not feeling optimistic about their futures. I want to end with a few more points for beyond this project, for your project. Whether there are some inter-phase or connections between a project like this and the road of a private collection and looking for alternative ways. Now these are very scattered points, in no fashion this is a concrete suggestion but points that come out of my treatment of this example for this occasion. Again, this is framed within some of the contemporary literature about the new museum. The first point I want to make is that there have been shifts over the past three decades towards museums that recognize the public is made of very diverse groups, so the question of whether you call it trans-cultural diversity in their identity, whatever ways you conceive of this identity. I think this is increasingly recognized in the curatorial reflection that the public is not just of one aesthetic ideological or political orientation. That it is actually increasingly mixed. The second point: museums and the world of cultural theory, cultural theory not necessary in the sense of “high” theory but theory in the fact of re-conceptualizing the practice and the impact and the ways of making cultural, artistic practice viable and socially relevant. The third point: advocacy in this case is clearly a concern. In the case of the M minus, advocacy can be thought of both in terms of the particular themes that have been chosen, but also at the same time in terms of the use, the engagement through art in cultural practices for critical action or critical self-reflection. Advocacy therefore becomes a crucial concept in developing responsive museums and their audience. It is at the core of our concern. Fourthly, the educator. Because museums tells stories, and I suppose however you want to define and specify the specific nature of art, it educates people or tells people a story or shows people stories without actually telling them. Or it shows people the frame of ordinary life experience without actually telling them this is a lie, this is true. But no, this is not lie, this is the world, this is the social reality that we live every day. So the road of educators as the audience’s advocate is changing from a more conventional kind. It also poses challenge to our own learning style and preferences for presentation. Finally, two more points. There is also the need to do more in-depth visitor studies. Finally, the concept of partnership, which is both central to contemporary art and cultural policy, whether is government driven as in the case of M+ or more community based as in the case of the M-. Partnerships open up more funding streams than other approaches to the development of a cultural site. Now, this is unfortunately or fortunately not what M+ started out to do. It started out as a top-down project, funded by huge funds of public money, which actually disengages people, and because there is no ongoing or simultaneous attempt to develop partnership or whatever ways whether the community with the art people, or with the business sector. I think partnership is still very important, it determines how art is being developed in areas other than conventional art sites, for instance at schools and in neighborhoods with middle-class people living, or where more grassroots people are living. I an issue like housing is very interesting because it concerns everyone. This points to the need for two way traffic between the partnership site, whether there is education or otherwise, and the cultural site and both could see each other as locations for learning.